The third-generation iPod shuffle is here—and by here, I don’t mean in the insubstantial “floating in the air of human knowledge” sort of way. I mean here, at my desk, in the Macworld offices. To prepare for my briefing Thursday morning with Apple, at which time I received said shuffle, I asked the people who follow my Twitter feed what questions they had about the shuffle. And while some of the questions were quite silly (“Can you wear it as a hair clip?”), most of them were quite perceptive. I asked some of them of Apple’s Greg Joswiak, the company’s VP of iPod and iPhone product marketing, and explored more of them while using the product itself. Here’s the scoop. What’s the deal with putting all the controls on the headphones? It turns out that this is a story that begins with Apple releasing its new headphones last fall for the iPod nano, classic, and touch. These headphones have a center button for playing and pausing (one click), moving forward (two clicks), and moving backward (three clicks). According to Joswiak, the headphones were the thing that made Apple’s iPod designers realize they didn’t need to put any controls on the shuffle itself. What about people who don’t like Apple’s headphones and want to use their own? What if I want to plug the shuffle into my car stereo via an auxiliary port? Apple says that third-party adapters that add control buttons to any set of headphones are on their way. Not a great answer, but there it is. How does the VoiceOver navigation system work? 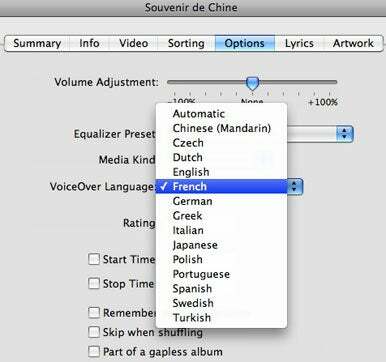 iTunes now lets you set a VoiceOver language. I speak English, but some of my tracks are by French and Italian artists. Will the VoiceOver voice mangle the track and artist names? It might, but you can fix it. iTunes attempts to detect what language your track name and artist name are in, and if it’s not English, it will attempt to use an appropriate voice for that language to pronounce things properly. (I tried this on a few Jean-Michel Jarre tracks I own; the ones with French titles were described in French; the ones with English titles were mispronounced in English.) But you can override the language by choosing Get Info in iTunes and clicking to the Options tab. There you’ll see a VoiceOver Language setting, and you can manually force the track into any of the 14 supported VoiceOver languages. Can the new iPod shuffle speak my music catalog in Swahili? Sorry, the only languages supported are Chinese (Mandarin), Czech, Dutch, English, German, Greek, Italian, Japanese, Polish, Portugese, Spanish, Swedish, and Turkish. How can I play from a single playlist instead of the entire contents of the shuffle’s library? If you’re an impatient person (or have a lot of playlists), there’s good news: You can press the up or down buttons to quickly move to the next or previous playlist in the list. I load audiobooks and podcasts onto my shuffle. What happens to them? Each Audiobook you load on the shuffle gets its own playlist in the spoken lists of playlists. Podcasts all pile up in a single “podcasts” playlist, also created automatically. Is it hard to control the VoiceOver? No, but using an interface dangling from a cord coming down from your ears takes some getting used to. Personally I’ve never liked those inline cord buttons, but I admit that I may just be an old fuddy-duddy on this point. Are the earbuds the same size and shape as the 3G iPhone’s? It’s worth noting that Apple does sell a pair of in-ear headphones with the same set of buttons for $79. I lose or break my headphones all the time! How much will it cost to replace them? Apple sells the headphones that come with the shuffle separately for $29. Too early to tell. We’ll be testing the audio quality shortly, and will get back to you with the results. 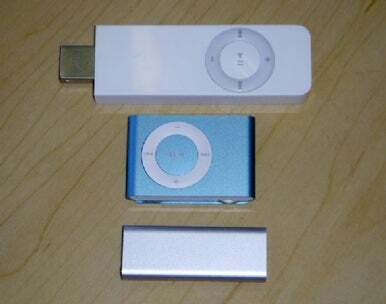 The new shuffle and its dock. Does the stainless-steel clip on the back scratch easily? Can you use the iPod shuffle as a flash drive? Absolutely. It’s just the same as with previous generations. There’s a box you can check in iTunes that allows you to enable Disk Mode, at which point the shuffle will mount on the desktop. Is the iPod connector the same as all other iPods? No, this is a new connector. It’s basically a small cord with a USB port at one end and a mini headphone jack at the other. And if you bought one of those slick adapters that connected the second-generation shuffle via USB without using its awkward included dock, I’ve got bad news: they won’t work on this third-generation shuffle. The bottom is just anodized aluminum. The only seam on the case is beneath the clip on the back side.